Data, Data, Data-Making it Happen! I want to officially welcome you to the 2018-2019 school year at Mann Elementary, where we “Make it Happen! No Exceptions! No Excuses!” For those of you who are new to our school, I want you to know that Mann Elementary is a wonderful place, where our teachers and staff are passionate, caring, hardworking, and always learning something new for the benefit of your child(ren). This year our school theme is “Reaching for the Stars...one star at a time”. We want every student to reach for the stars and obtain success academically and socially. Below are some of our initiatives to help all students “Reach for the Stars”. Mann Elementary is proud to be a Leader in Me school! We believe this has a tremendous impact on our students, staff, and community by teaching and practicing the 7 Habits of Highly Effective People. The Leader in Me empowers students to make positive, effective, and responsible choices. The “Parent’s Place” is available at www.TheLeaderinMe.org. Here you will find ideas to use at home to reinforce your child’s learning and involve the family in a fun, interactive way. Please mark your calendar for our Meet & Greet and Ice Cream Social on Monday, August 13, 2018 at 3:30 p.m. You will have an opportunity to meet the staff as well as your child’s classroom teacher, buy Mann t-shirt (cost is $10), and a free backpack (while supplies last)! School Hours – 8:05 a.m. – 3:02 p.m. – Supervision begins at 7:35 a.m., so in the interest of safety, please do not drop your child off before that time. Bus Information will be mailed from the transportation office. You can call the transportation department if you have any questions at 314-345-4469. School Uniforms are khaki or navy bottoms and white, navy, light blue or red polo style shirts. We look forward to serving and partnering with you to ensure your child achieves their highest potential. We are dedicated to making your child’s educational experience positive and rewarding. Should you have any questions or concerns, please do not hesitate to contact me at (314)772-4545 or email me at angela.glass@slps.org. 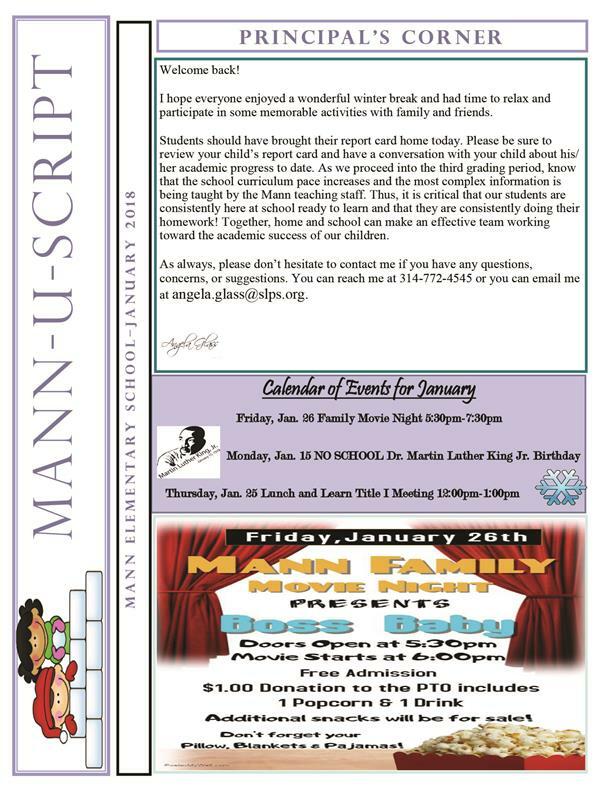 Remember, you are always welcome at Mann. Making it Happen! No Exceptions! No Excuses! We are empowering lifelong learners and successful leaders. We will nurture positive relationships with students and families. We will show all students how to be individual learners and problem solvers. We will collaborate and work as a team. We will embrace and nurture differences by being culturally responsive. We will be a CHAMPION for every student!